You’ve surely seen it by now, the 8½-minute video which has had over 31 million views within the last four weeks. I am referring to the video with Tommy Jordan, the dad who destroyed his 15-year-old daughter’s laptop by shooting it several times with a gun after he discovered her disturbing Facebook rants. Tommy, along with his daughter, Hannah Marie, were guests on NBC’s Today show this morning and were both asked about the video and the laptop shooting. No, I wasn’t surprised to hear her explain that she feels her father overreacted but also understands it. I’m still undecided about how I feel about the way he handled the situation, but I surely can relate to his level of aggravation. We’ve all been there before. We become so upset that we just want to destroy the object that has created our distress. Honestly, the first thing that comes to my mind when I think of wishing to completely demolish something has to be that ol’ bathroom scale. I haven’t owned one for over a decade now, but during those 25 years of yo-yo dieting, I surely could have done the same thing to it as this father did to his daughter’s laptop, without a doubt! 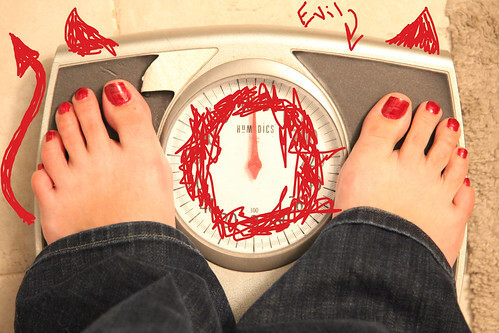 We — the bathroom scale and I — just never seemed to get along very well. In fact “he” was probably my worst enemy, creating for me what would start out as a lovely day and turn it into a day of depression and anger. He didn’t have the ability to post anything on Facebook, thank goodness, but the numbers that I would view each morning on his smiling face were enough to cause me to despise him nonetheless. There were days when I wanted to throw him out the window… and eventually did throw him out, into my trash can! But I didn’t throw out my bathroom scale because of any level of my aggravation. I threw him out because I was done weighing myself once I made the decision to simply live healthier. I knew that my goal wasn’t to see how quickly I would lose weight, but to simply lose it eventually — no rush. Weight loss plateaus were not going to cause me any more anger like they had done for several years, so my lovely friend had to take a trip to the local dump. It felt good to bid him farewell! There were other items in my past that I would have liked to destroy or at least bid farewell to also, like the photographs taken of me when I was morbidly obese. Many were torn up years ago when I hit the same level of aggravation that Tommy Jordan did when he read his daughter’s Facebook posts. Yet there are still some old pictures that I find on occasion, ones that made it through those days of distress. I suppose I’m glad that they are here for me to look at now, as they show me how far I’ve come and they prove to me that I was wrong to assume for 25 years that I would never lose weight. Comparing those old photos to the newer ones that have been taken over the last 10 years is enjoyable. They are reminders that not only did changing my lifestyle work to take off the weight, but that it has been the key in keeping off the weight also. Looking back now, I’m happy that I didn’t tear them all up to shreds because those actions would have taken away some of the joy I receive from them today. Hmmm, maybe if I would have made a video of me throwing away my bathroom scale it would have generated the same response. What do you think?